Review: In Bigger than a Breadbox, our protagonist Rebecca had to contend with her parents’ divorce and her own identity aside from her family. 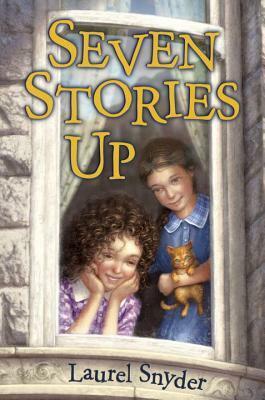 In this companion book we see Rebecca’s mother Annie go through her own identity-shaping moment. It’s 1987 and Annie and her mother drive to Baltimore to see Annie’s grandmother before she dies. All Annie knows is that her grandmother is an angry woman, and her mother has intentionally kept her out of their lives. Then Annie finds herself transported to 1937, and meets her grandmother when she was still Molly, still a girl her own age. Through her time with Molly, Annie starts to understand what happened that made her grandmother the bitter woman that she turned out to be – and both girls go through experiences that change each other for the better. Time travel is a tricky genre. How in depth should a writer go? It needs to be well-thought out enough so that the reader isn’t distracted by plot holes in the inner workings, but also not so overloaded with time and space detail that we lose track of the story. Snyder has a gift for establishing just the right level of magical “rules” so that as readers, we know what to expect, but we aren’t overwhelmed with detail and hypotheticals. Without giving away spoilers, I think that the ultimate resolution wrapped things up neatly without being too magical-solution-based. But like in Breadbox, the magic is a vehicle for storytelling and character development more than it is a plot piece in and of itself. The story’s magic is a means for both Annie and Molly to figure out who they are, what matters to them, and who they want to become. I liked both of the protagonists, and I know that as a kid I would have really identified with and liked Annie. She’s our entrance point into the past after all. But as an adult reader, and in looking at the book with a Slatebreaking lens, I really appreciated the characterization of Molly. Here we have a character who is selfish and spoiled and sometimes downright mean – but who we also have great insight into why she behaves the way she does. And her transition into a kinder, more thoughtful person is not a magical behavior transformation, but as a result of direct action that she takes. And while we’re thinking about the way characters grow up from childhood to adulthood, and what that says about who we are, I loved seeing the pieces of Annie as a girl that inform the parent we see in Bigger than a Breadbox. You certainly don’t have to one book first to enjoy the other, but I think that as a companion piece they work together beautifully. This entry was posted in Middle Grade, Reviews and tagged Family, Historical Fiction, Middle Grade, Time Travel. Bookmark the permalink.